On 6 January 1866, several Hamburg shipowners established the "United Bugsir Steamship Company". After various name-changes, it became the "Bugsier Tow and Rescue Corporation". In January 1926, Wilhelm Schuchmann became the President of the Bugsier and began a world-wide rescue firm. 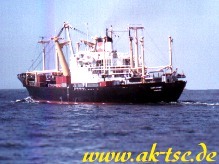 Until a few years ago there was also an active cargo ship business within the Company. The flag-ships of this fleet were constructed in the North Sea shipyards at Emden. The MS Weserland was one such cargo ship of the fleet, and sailed the oceans in the years 1978-1981 as the "MS Lloyd Sydney" on charter to the Lloyd Brasiliero company. It was my good fortune to be allowed to call this charming lady my home in 1978 as well as for the period 1979-1980, during which time I made many long voyages on her. I have followed her progress of "my" Lloyd Sydney since then, and showing you her pictures on this site allows me to remember her, and thank her for the fine times I had on board. I can also, at least in pictures, keep her alive. 1 x 7-cyl, Second-Generation Sulzer diesel engine, 11,200HP, 18,3kn. Completed on 23 June 1970 by the Rhine Steels North Sea Works GmbH, Emden. She was the 412th ship constructed there. She was then delivered to the Bugsier Reederei-und Bergungs AG, Hamburg. In May 1972 she was renamed Concordia Weserland, in February 1973 renamed MS Weserland, and renamed once more in February 1978 as MS Lloyd Sydney. In January 1981 she was again renamed, reverting to Weserland. On 18 May 1984 she was bought by Pacific International Lines (Singapore) and renamed MS Kota Timur. Eight years later, she was bought by the Golden Splendour Shipping Corporation - Kenco Shipping Ltd, Hong Kong (China),registered in St Vincent and the Grenadines, and renamed MS Golden Splendour. She was no longer on the Lloyds Shipping Register in the year 2000. Arrived in Alang, India on the 21th November 1998. Offical broken up on the 22.12.1998.